Can u tell me what kind of switch is this with the capacitors? It's a 3 position DPDT. In the centre position you'll have 68nF, one position would be around about 100nF and the other position would be over 100uF (which would be the bassy setting). very thanks. Can u tell me is the 100R resistors are 100 ohm resistors? ok thanks again and one question about the switch is this on-on-on or on-off-on ? on-off-on. Centre position off so just the 68nF cap on the board is in circuit. 2 more q. Are the potentiometers B or A. Is - from battery connected to ground? Hey, cOuld you do a vero version of this? I tried to do one but it is not working. I've got a verified Woolly Mammoth layout which could easily be adapted if you want that. That sounds good. Is it already posted? And also 1N4007 diode between 9V input and 100R? The 2N2222A will certainly work, it's all going to be down to preference as to which you prefer. The 1N4007 in series with the supply is just for reverse polarity protection and the 100R is a current limiting resistor. Neither will have an audible effect and I excluded them to keep the layout as compact as possible. I've just never been too concerned about it really because I use a standard negative ground daisy chain so it's never going to be an issue for me, but it's easy enough to add them in if you prefer. 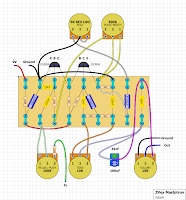 I built mastotron pedal by this schematic now. I have 2 problems wits pots: "volume" pot didn´t work (it didn´t change volume level) and "fuzz" pot only works when "pulse width" pot is minimally 60-70% up to 100% (fully clockwise). Hmm well if the volume pot isn't working there is definitely something seriously wrong. That either passes the signal to the output or dumps it to ground (and so makes it progressively quieter) and so there's not a lot that can go wrong with that one. I suspect that either the pot is knackered, or you must have a grounding problem somewhere. It may be worth checking the values you're getting through the rotation of the pot with a multimeter. The change in resistors should be fairly smooth and the midway point should be exactly half with a linear pot. I'd check that and then maybe reflow the ground connections from both pots to see if that could be the issue. The input and output wires go to the switch as shown in this pic. All the grounds are connected together with all other grounds such as the socket sleeves, DC socket negative. hey IvIark, thanks again for another awesome build. doing it as we speak. I'm struggling to source the 5k reverse log pot. does it HAVE to be reverse log, what if it is standard log? I wouldn't use log, but I used linear in mine and it worked fine. If you do want some 5K reverse log pots though, Tayda has started stocking them. cheers, I will try linear. I'm based in the UK so if shipping isn't too bad I will order some. prices look pretty good on that site though! have come back to this after a few months and this time I have the right pot. I have wired it up on my breadboard and can't seem to get it to work. all the knobs seem to do what they are meant to but the fuzz that comes out is VERY weedy and almost non existent when on a quieter pickup. can somebody post a photo of finished assembly of the board? this is my first attemt to build a stomp... so sorry for asking.